Tips for saying “thank you” like you mean it. It is often said that PR is a thankless job. But yesterday while at work, I kept a running count of the number of times I was thanked for things throughout the day – in writing, by phone, and in person. The total? A whopping 93 times… in a single work day, while just sitting at my desk. That’s 10.33 times every hour – which means that basically, once every six minutes, I am being thanked for something. Now…I am just NOT that awesome. Moreover, I have no access to the public, there were only nine people in the Redpoint office yesterday, and I spent most of the day quietly alone, writing at my computer. So why the outpouring of gratitude? A letter from American Express thanked me as part of a notification that my account may have been the victim of fraud. An email from someone shared the unwelcome news that, “Sorry, but we’re not sending you a check this week as we promised,” and was closed with a simple “Thanks,” at the end. A woman who cut in front of me in a ladies room to use the hand dryer before I got to it looked at me and sheepishly said “thanks”…as if that somehow excused her behavior. In fact, the number of times I was legitimately thanked for something yesterday was only 37. All the others were just automatic thanks given without deliberate thought…and therefore, sounded insincere. The upshot of all this meaningless thanking is that the word “thanks” has lost its punch. So when you REALLY want to express gratitude for something, “thank you” often doesn’t cut it. If you have “Thanks” as part of your automatic email signature…take it out. Adapt your closing to suit the message, be it “Cheers,” or “Best,” or “Kind Regards,” or “My Best,” or even “Enjoy your day,”…or whatever takes your fancy. Embrace the difference between expressing thanks and expressing appreciation. The person mentioned above who delivered that unwelcome message about the check could have said “Your patience is much appreciated.” While it’s not a hard and fast rule, “thanking” someone is usually an appropriate response to something they’ve done or said (or not done or said) but essentially, it’s tied to THEM and their actions. Appreciation is tied to YOU, and how you feel. You can appreciate someone’s kindness in the same way you can appreciate the beauty of the sunset…but you’d never “thank” the sun for setting. Change up your wording. When you say “thanks” dozens of times each day, it even becomes white noise to YOU. Try different phrasing: I can’t thank you enough… thank you doesn’t do it justice… I am so grateful for… your kindness meant the world to me… I’m so appreciative that… and so on. 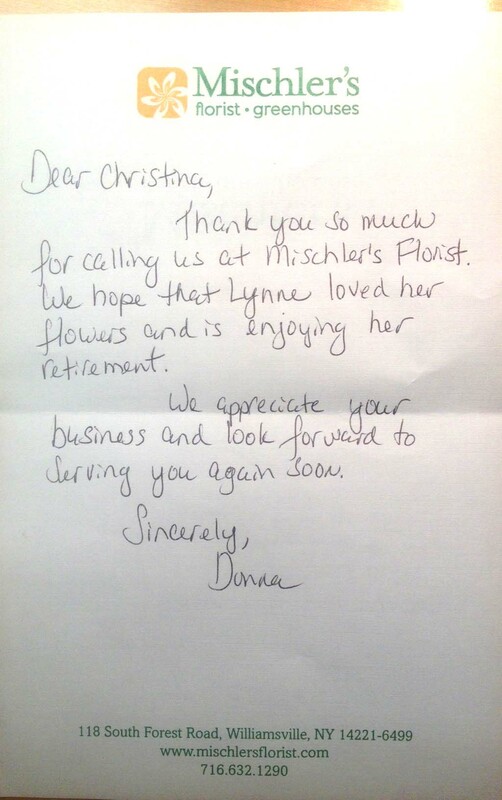 Way to go Mischler’s of Buffalo. You’ve given me a new communication puzzle: what’s the appropriate way to thank someone for sending an awesome thank you note? I think you just gave the most beneficial and appropriate “thank you” by showing everyone who reads your blog what a great company to do business with they are!